"Another villa stay at Desert Springs, a quality resort that keeps it's standard. Check in was easy, villa superb and such a relaxing place to be. Staff as helpful as ever. A visit in June each year has become part of our calendar." Just wanted to thank you and the team for another perfect stay at Desert Springs. As usual arrangements were perfect on arrival and during our stay at La Rosa. June is such a lovely time to come, and we have to say Desert Springs looked as good as ever, particularly the fairways and greens this year. So relaxing we loved every minute. Our only decision is not if but when we come again, hopefully we can fit in another visit later this year, but we will be back for our regular visit next June for sure. Six of us stayed here in June. Accommodation was spacious and comfortable. Fantastic pool area and very relaxing. The villa was well kitted out with plenty of utensils etc. a car is definitely needed, we visited mojacar a lovely village around 30 mins away. I'm sorry we missed you at Desert Springs when we were there but I just wanted to drop you an email to thank you very much for organising our stay at the resort. We had a great time there and enjoyed our golf. The food and drink we had at the Restaurant was fabulous and all the staff at the resort were lovely to meet and deal with. Should we plan to come back to Desert Springs in the future we of course will contact you. 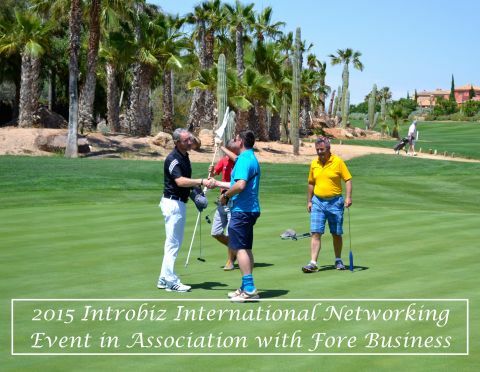 Introbiz & “Fore” Business Inaugural International Networking Event at Desert Springs Resort. 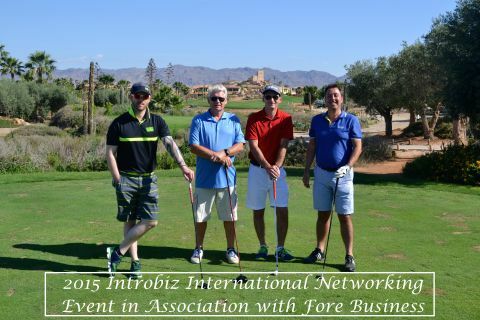 Desert Springs Resort was host to the inaugural Introbiz & “Fore” Business International Networking Event between 12th – 14th June 2015. An array of companies attended, enjoying two nights luxury resort accommodation with breakfast each day, a Welcome Reception and BBQ networking event on the arrival evening, use of the Golf Academy practice facilities followed by a round of golf on The Indiana course, culminating with a networking event dinner at the resorts award winning ‘El Torrente’ restaurant. Guests enjoyed the incomparable social ambience that can only be found at Desert Springs, and a high level of interaction with all in attendance providing a great opportunity to develop their contact list and create new business! “Everything about the event has been sensational. All of the small little extra touches and attention to detail really make Desert Springs ‘DIFFERENT’ to the rest! Thank you again for your hospitality over the weekend, you certainly have a great team, that just GET IT! “What a fantastic few days and experience with wonderful company we have all had. The course, service, food and attention to detail has been outstanding throughout. This inaugural event is now the platform for more of the same and we are looking forward to returning again and to develpoing further international networking events here at Desert Springs Resort. Thank you to all!" "It was a pleasure to meet you and spend some time at your wonderful resort. Your team were amazing; always friendly, helpful and nothing was too much trouble for anyone of them. A really nice touch to put the slide show together too. The golf course was a tough examination but a thoroughly enjoyable test – especially for those that like a challenge." "I really have enjoyed everything about my stay, the service, the golf course, the food, everything was wonderful. I loved the golf course and we have been so well looked after, inclusive of my perfect massage!" "A great event and a great golf course. The food was beautiful too and I am looking forward to coming back, thank you!" "Fantastic service at a fantastic resort. Thank you for the wonderful hospitality." Thank you both and the staff at Desert Springs for such a wonderful time. Yet again we enjoyed every minute – golf, El Torrente, Barbeque at 4 Sierra Drive with Roxana & Jesus looking after us – so we will be back for more sitting at home without an ounce of energy left !!! but feeling content. See you when we return later in the year! Thank you for your assistance with this trip, I am sorry we did not actually get the chance to meet each other. We had a wonderful weekend and my wife almost convinced me to buy a property! My stay was also memorable as I had a hole in one while I was there and received a lovely certificate from your resort. First, I wanted to say that we had a really lovely time at the resort. Everyone was so friendly and nice and the facilities were great. Thank you to everyone who assisted us and made our stay so memorable. Thank you again for all your help with our holiday. A quality resort in all aspects of accommodation, facilities and professionalism and friendliness of staff at all levels. Return directions to Murcia airport would have been helpful. Ice cube trays were the only things missing from the apartment. We would definitely go back next year! We have just returned home from our fabulous stay with you. I am sorry I did not get chance to meet up with you to thank you in person. We shall definitely be returning at the same time next year. All the staff were absolutely first class and a credit to you all. We're at Desert Springs this week for our second visit. It is a great place for a family holiday. Despite the fact that it is half term the resort is not overcrowded and there's enough to entertain the kids so that my wife can relax with friends and I can get out on the golf course. The food is good with some of the menu options changing daily and the service is excellent, staff all speak good English and nothing is too much trouble. The golf course is in superb condition, but it is a desert course so if you're off the fairways you're in trouble. Take one of their buggies as it can be very hot and carrying clubs only for the young and very fit. Despite half term really no problem getting tee times. The bigger villas come with private pools, but our 3 bed villa is in a gated area of about 8 villas sharing a pool. Ideal for the kids to make new friends. Villas are clean, comfortable and well maintained and none of them are more than a few minutes walk from the main restaurant and clubhouse. There's also the Crocodile Club, which is a larger pool, bar and cafe, with table tennis, tennis courts, giant chess board, basketball hoops, etc. It's less than 10 min drive to local beaches, supermarket, gokarting and a fantastic waterpark (our kids would happily spend every day there!). A delightful place and what a great time for a group of people. Originally disappointed as only one restaurant was open, but it was great, plus we booked the cave bar for a private function which was marvellous. I hour and a bit from Murcia airport and a supermarket 5 mins away for supplies. Rent off them direct and not private as we had a leak and they sorted it. Golf course was great and shot an 80 with rental clubs so happy. It is a very well maintained golf course with very friendly staff & fabulous facilities. It offers luxurious accommodation with outdoor pools. The Resort has spacious and well-equipped apartments, villas and cottages. Some villas have private pools. There are several bars, restaurants, a pool bar, an awesome African-style hut, a gym and a spa, free WiFi and free parking. It is a place to switch off or have fun. All very well maintained. It is located about 3km from Vera, Palomares and Cuevas del Almanzora town. Having bid for this holiday in a charity auction we were pleasantly surprised to find the resort exceed all of our expectations. The breakfast was great and the dinner great value for money. Great location too for the Coast. Garrucha has nice bars down at the marina and the tapas was great. I just wanted to pass you and all the team at Desert Springs Resort a short message to say thank you very much for taking care of us all last week on our vacation. The resort was excellent and the facilities & golf course were a pleasure to play. The next time we visit I hope we can do it when the Crocodile Club is also open. Please pass on my thanks to Julia (I think!!)……. (she has short brown hair!) at the golf reception for taking care of all the bookings and buggy’s for us. She was a star, along with the rest of the team. Thanks again for all of your help before we arrived, and apologies for the many emails I sent with lots of questions! Take care and have a great summer. My wife and I have recently returned from a 3 night unlimited golf break staying in a one bed apartment and have nothing but praise for an excellent resort. The accommodation is modern and comfortable. The apartments are well equipped (with ample free parking) and are situated in a lovely courtyard setting around a good sized pool. The golf course is in very good condition and we so enjoyed the various challenges. This was low season for the course so we were able to play 36, 45 and 51 holes of golf. We did use a buggy (30€) and the battery life meant the buggy was good even for 51 holes. To be honest a buggy is not required and they are restricted to buggy paths but when playing more than 18 holes we found a buggy an advantage. The bar and restaurant on site is open all day. We did not take breakfast there but the evening meal was very good and represented great value for money in a lovely setting. There is a gym which is available at a small supplement. We did not use the gym but from looking through the window it looked large with various machines and free weights. Service could not be faulted. From the moment we arrived at reception and were personally taken to the apartment to the friendly service in the restaurant and on the course we were made to feel genuinely welcome. Until the next time, thanks to all. Thank you for your e-mail and thank you for a fantastic break at Desert Springs. I have nothing but praise for the resort. We loved everything from the well equipped apartment, the beautifully maintained golf course, the quality restaurant and the first class service throughout. I have, today, posted a well deserved 5 star review on Trip Advisor which should be published in the next few days. Just a quick note to say what a wonderful time my friends and I had Desert Springs. We were totally relaxed and refreshed. The restaurant food and staff were wonderful and we enjoyed playing tennis. Even though we are not golfers we would love to return one day to the resort. 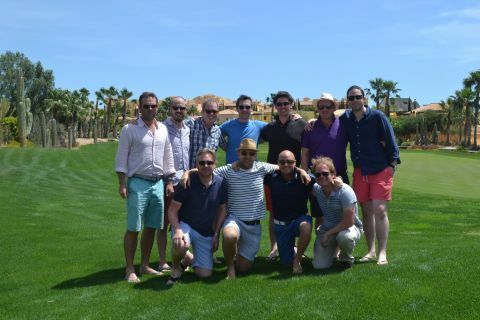 On Friday 8th May, Daniel Walker arrived with a party of 10 golfing friends to Desert Springs Resort for a 3-day golfing break. The group were accommodated on a full board basis in some of the privately owned villas at the resort and enjoyed 3 rounds of golf on the Championship Indiana course. "The reason for this mail is to thank Desert Springs for the way they dealt with the sale of the above property to my wife Angie and myself. The whole process was seamless from beginning to end, and this was largely due to your Commercial Manager Paul Gutierrez and Natalia Ruffinelli Gonzalez. Paul recommended to us a first class solicitor (Paloma Moreno-Torres) who looked after our interests both with the bank and at the Notary, Paul also explained to us all the purchase costs and at the end of the day, he was about right with his estimate. Natalia Project Managed the installation of the kitchen magnificently, taking on board all the changes requested by Angie, who now loves the kitchen. The overall result is that Angie and I are now the proud owners of a top of the range Town House on a Five Star Resort and we both look forward to spending as much time as we can out there. Thanks again to you and your staff."